Experiment #.... ? Heck I don't know I lost track. Anyway, this should turn out fine so long as the temperatures stay really really cold! 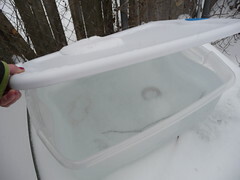 So I bought a 35 Qt plastic storage container that was short and squat from Ace Hardware at 50% off. I consulted my buddy Lance about how to freeze the clearest block of ice. I bought 9 gallons of water from the Meijer refill station which is only .29 per gallon. 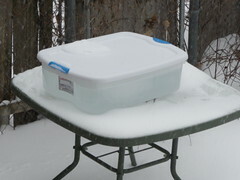 Early this morning I set up my block freezing in the back yard on top of a glass table top. I checked on it after about 10 hours and it looks pretty clear... so far.